A diary or journal kept by Francis Martin Drexel, a painter and 19th-century financier who was also the father of the founder of Drexel University. 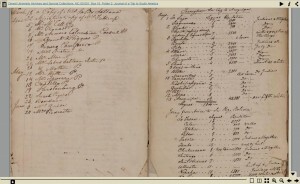 Mr. Drexel’s “Journal of a Trip to South America” records his sojourn through Bolivia, Ecuador, Peru, and Chile, where he painted portraits of local luminaries and learned the art of currency exchange. Mr. Drexel left Philadelphia in May 1826 and returned on April 30, 1830. This journal covers the period from November 29, 1826 to April 10, 1830, and depicts the many hazards of the journey, as well as descriptions of the places visited with interesting observations on the people of those countries. A typical incident is his detention on his arrival at Callao, the port for Lima, where his possessions were searched, his clothing and shoes cut open, and all his papers and money confiscated until it was established that he was as he represented himself to be. “Coming in, I found the general looking more pleasing, and told me that he had orders more than two months ago to arrest as a spy a German or Frenchman who would give himself out for an artist, or painter. If I was innocent, which he now believed I was, every paper, letter and money would be restored to me.”After proceeding to Lima, Mr. Drexel took up the pursuit of his profession, and obtained commissions for a number of portraits, among the subjects being Generals Bolivar and O’Higgins. The bound volume also includes a typed transcript and a privately-printed edition of the diary.